Remember the cup song that Anna Kendrick sings for her audition in Pitch Perfect? I’ve decided that the “ticket for the long way round / the one with the prettiest of views” must be about Banff National Park because “It’s got mountains, it’s got rivers, it’s got sights to give you shivers” – and the sight of Moraine Lake under the direct light of day definitely gave me shivers. 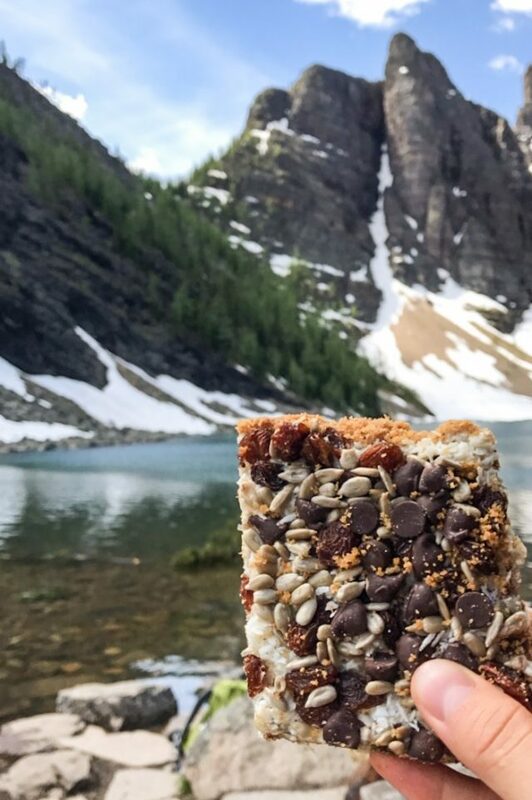 Lake Louise and Moraine Lake receive ridiculous amounts of tourist traffic in the summer, but for good reason. 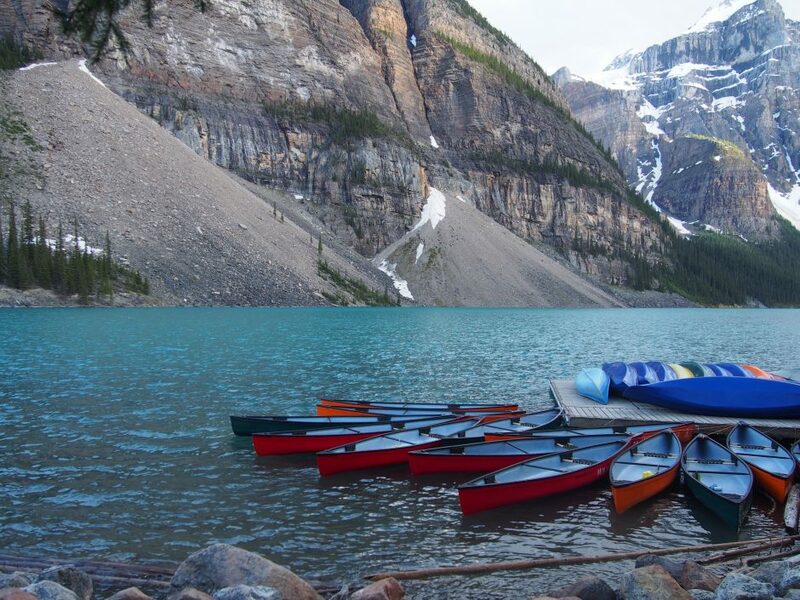 Despite the craziness of getting to the views and the parking battles in the small town of Lake Louise, the glittery blue-green waters surrounded by glacier peaks and lush green are a worthwhile reward. 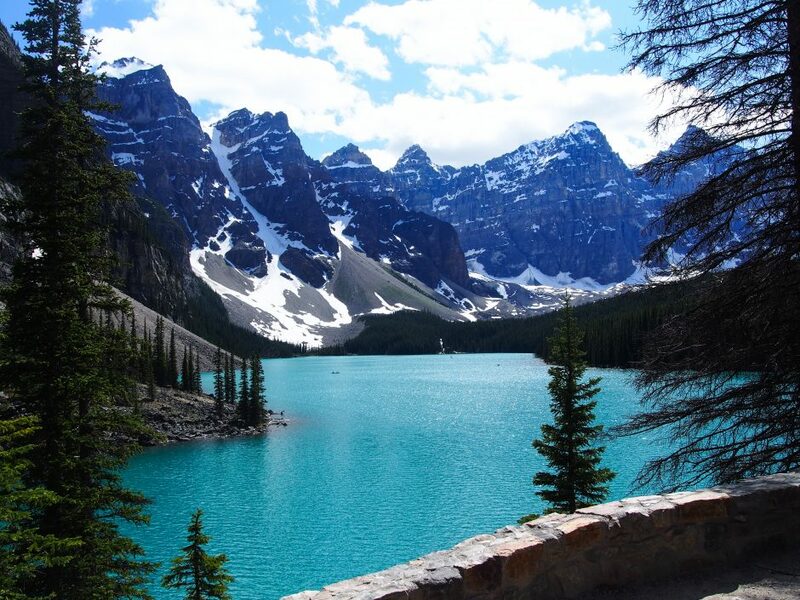 You can’t go to Banff without catching a glimpse of these gems! 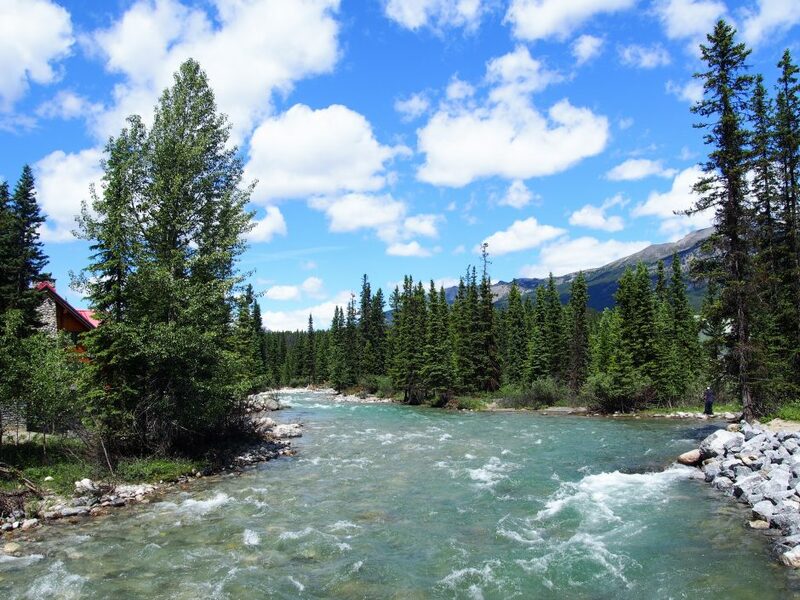 They’re about an hour driving northwest of Banff. We saved money by staying at the HI-Castle Mountain hostel halfway between Banff and Lake Louise. 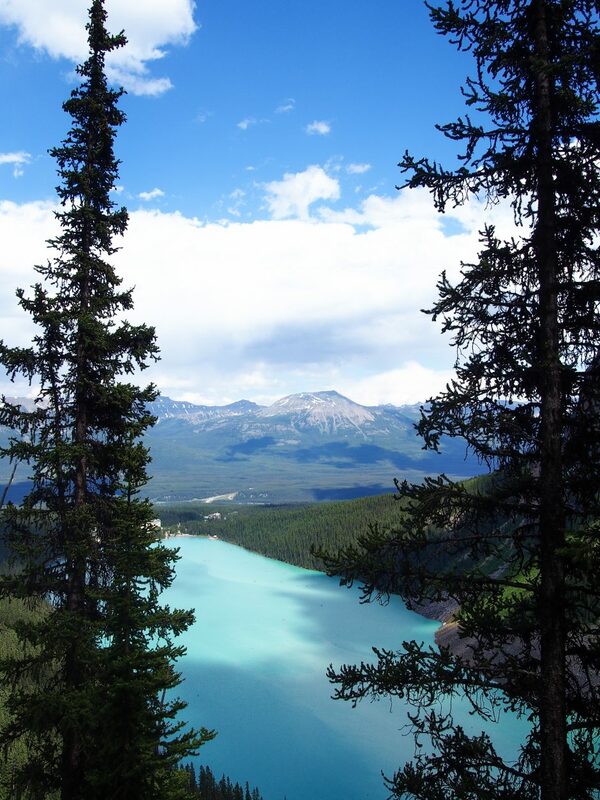 From here, I’d recommend driving north on the Icefields Parkway, towards Jasper National Park. We made a detour out to Golden, BC and Yoho National Park, which I’ll write about in the last installment of my Banff posts. That said, I think the two lakes deserve at least a day and a half together to hike at both as well as relax without feeling rushed. 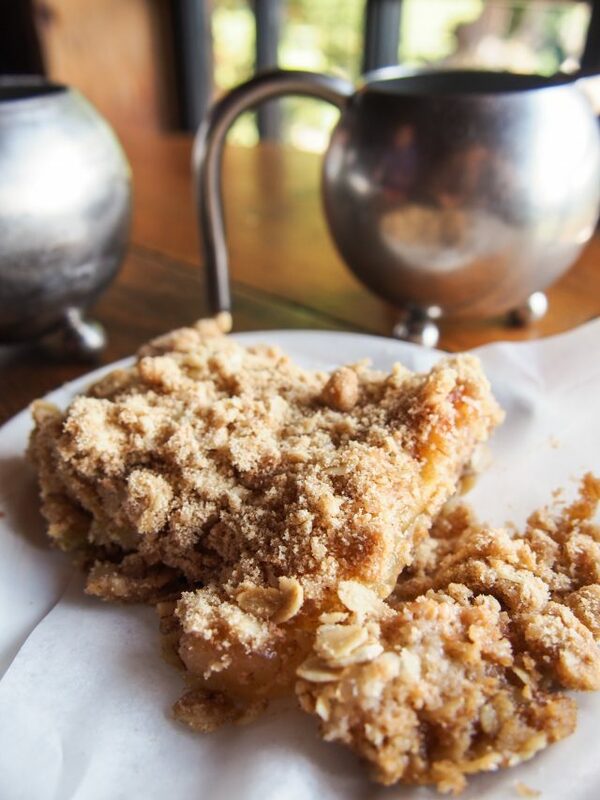 There’s nothing like a comforting cup of tea and some homemade sweets… after two hours of hiking, that is. The Lake Agnes trail from the Chateau Lake Louise takes you to this beautiful tea house on the mountain top. It’s not just any old tea house – originally built in 1901, the tea house still has no running electricity or water. It blows my mind that the staff hike up and down with supplies 2-4 times a week! That’s 2.2 miles each way, with an elevation gain of 1,312 feet just to bring up ingredients and pack down the trash. The staff are so overwhelmingly busy in the summer, I actually felt pretty bad for them. Be prepared to wait in long lines if you go during high season… it’s worth it. Apple crumble – pretty basic. Would’ve been great warm with vanilla ice cream, but obviously… no electricity…. My favorite was the mountain bar (in the first picture). I haven’t found any recipes floating around online, so I’ll have to try and recreate it from memory! The warm spices of my chai tea latte went perfectly with it. For you tea connoisseurs, the tea house carries over 100 types of loose leaf teas sourced from all around the world. You can also get sandwiches and soups that I’ve heard are all very good. I didn’t realize this before we went, but the Chateau has several dining options inside. I would’ve loved to eat there if we had more time! There’s a deli that has coffee and picnic meals to-go, a fondue restaurant (Walliser Stube), a nice Italian place (Lago Italian Kitchen), a casual French-Canadian restaurant (Poppy Brasserie), the fancy schmancy Fairview that serves afternoon tea, and a couple bars/lounges. Lake Louise village is small and everything in the area is going to be overpriced, so don’t expect the variety of options in Banff. 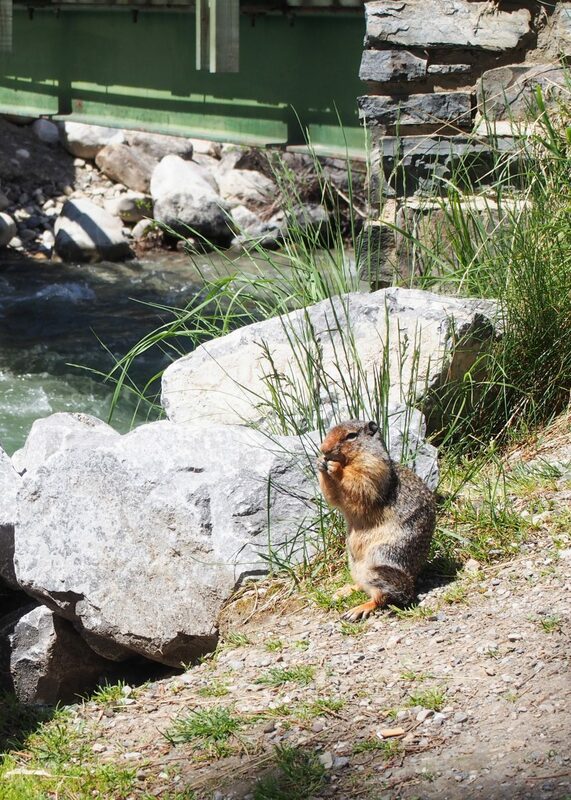 Whatever you do, skip the Village Market, the grocery store in Lake Louise Village. It’s horrendously overpriced ($10 for a box of Cheerios, no joke!) If you’re planning on packing things for the trail, make a stop at the store in Banff before you get to the Lake Louise area. In order to enjoy tea and goodies at the Lake Agnes Tea House, you have to, well, get there – either on your own two feet or by horse! 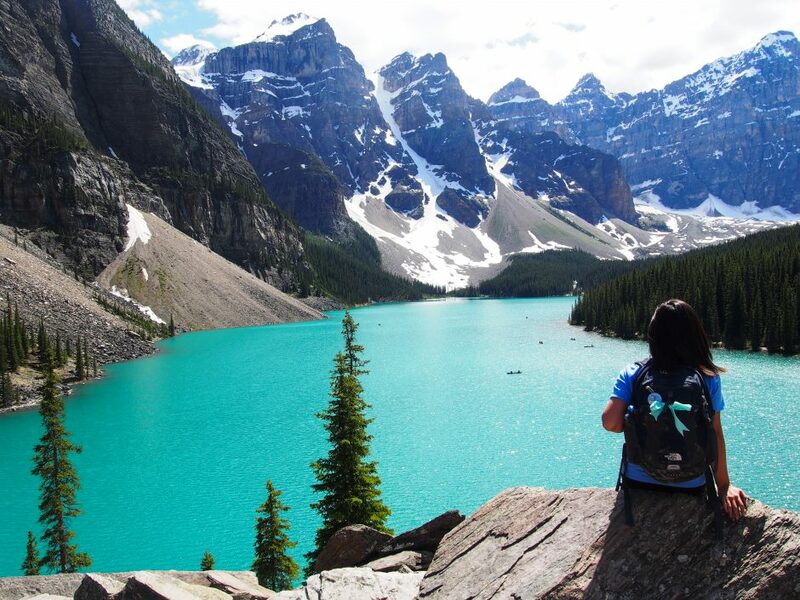 That’s right, if you don’t want to hike to the tea house, you can hire a guided horse trail through Brewster or Timberline Stables in Lake Louise. I think we accidentally took the horse trail on the way up and battled flies and mosquitoes the whole way. Don’t forget to bring bug spray! From the tea house, you can continue onto the steep Big Beehive trail. The summit looks over the spectacular milky green color you don’t see from the vantage point of the Chateau. At the time that we hiked this (late June), there was still snow on many parts of the trail. Not so much that it was impossible, but definitely scary without the right equipment. Don’t be like me and try to hike through snow in old ratchet running shoes! Apparently there’s a gazebo shelter at the top of the beehive, but I don’t remember seeing one. It actually started drizzling lightly soon after we got to the top, so we started making our way down pretty quickly. If we’d seen the gazebo maybe we would’ve lingered to enjoy the fruit of our labor. The descent basically destroyed my knees, though… definitely use hiking poles if you have bad knees. I’m not in the worst shape and I thought the hike was very strenuous, although more experienced hikers may think differently. Be prepared for some rock scrambling. MY FAVORITE VIEW IN NORTH AMERICA! Partly due to the unbelievably stunning water, and also partly due to the exasperation and stress that went into getting to this point. 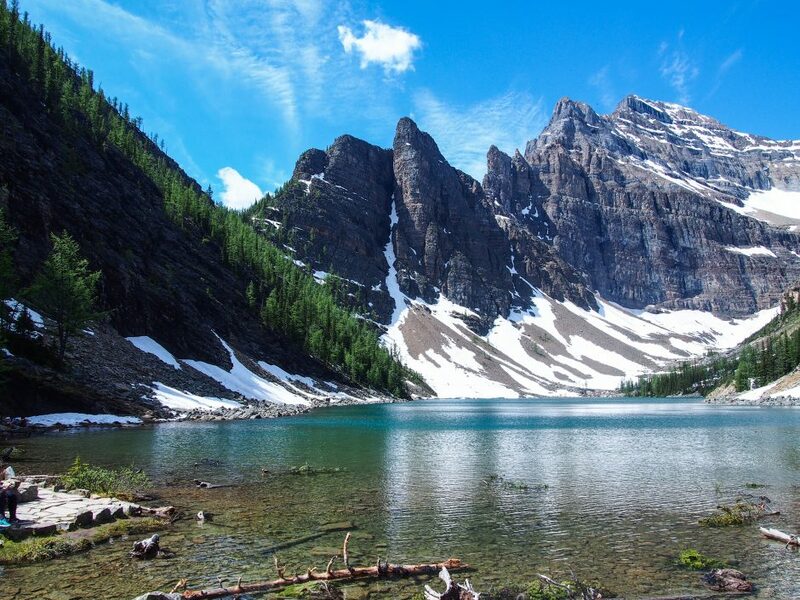 Prior to leaving Banff, we’d met some people who urged us to “go to Moraine, if you can make it there” – they made it seem like it was hard to get to, even though Google maps showed that it was only 8 miles away from Lake Louise. The first minor blip? GPS said it was an hour trip to drive those 8 miles. Not sure why, but it was less than 20 minutes – Google Maps needs to fix this! //TLDR; If you’re visiting at the peak of tourist season, park at the Lake Louise overflow lot, take the free shuttle to Lake Louise Village, and wait for the Mountain Park Transportation shuttle in front of Wilson Mountain Sports in the village. Bring cash. If you look reaaaally closely, at the top of the hill there are some little colorful specks that are people! So. 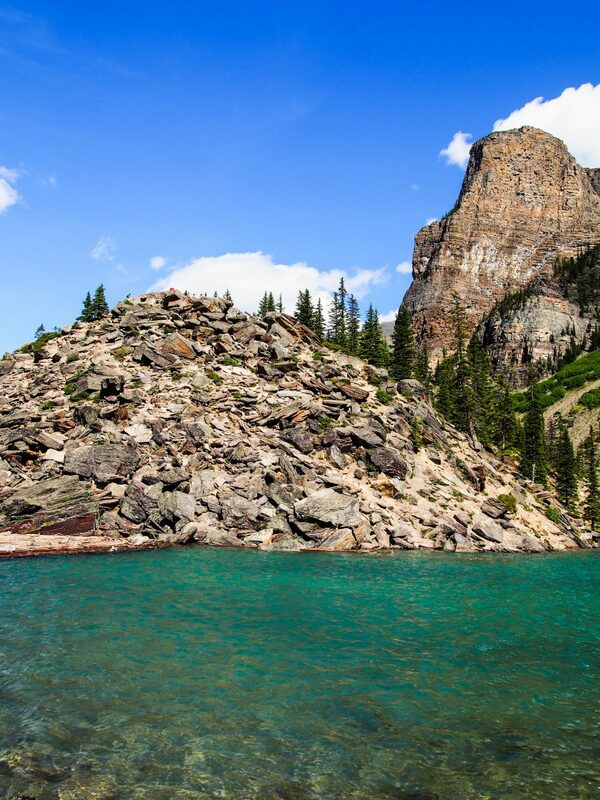 Once you actually make it to the lake, right in front of you is this giant rockpile. 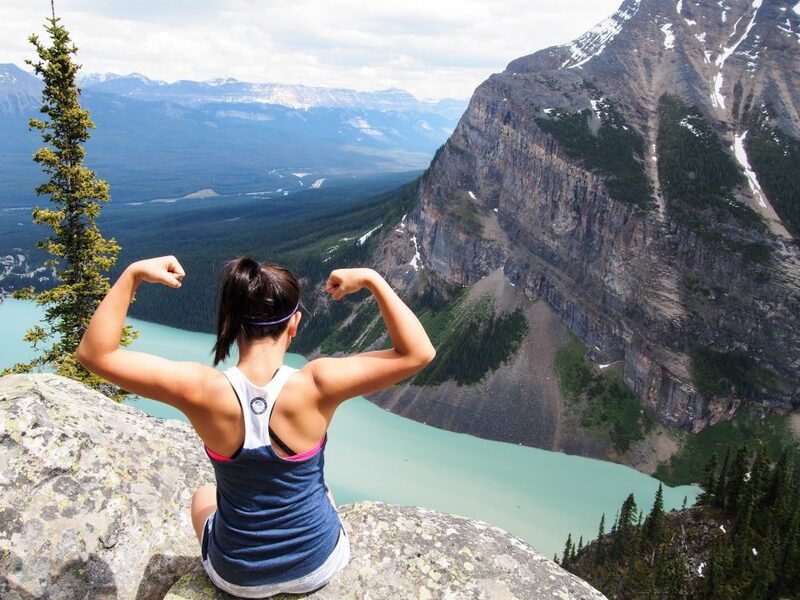 From the top, you get the best views of the lake and the Valley of the Ten Peaks. At first we were really confused about how people got up, but there’s a path that starts after you cross the bridge to the left . It’s not that intimidating because there are actual stairs carved into the rocks. I even saw a bride wearing Toms with her dress hiked up, on their way to take some drop-dead gorgeous wedding photos. I took my sweet time up there, before making my way back down and starting on the trail around the lake. Make sure you check the timetable to catch the last shuttle out of Moraine and back to the Chateau! Mountain Park Transportation drops you off at the Chateau Lake Louise, and from there you can get on the free shuttle back to the overflow lot. 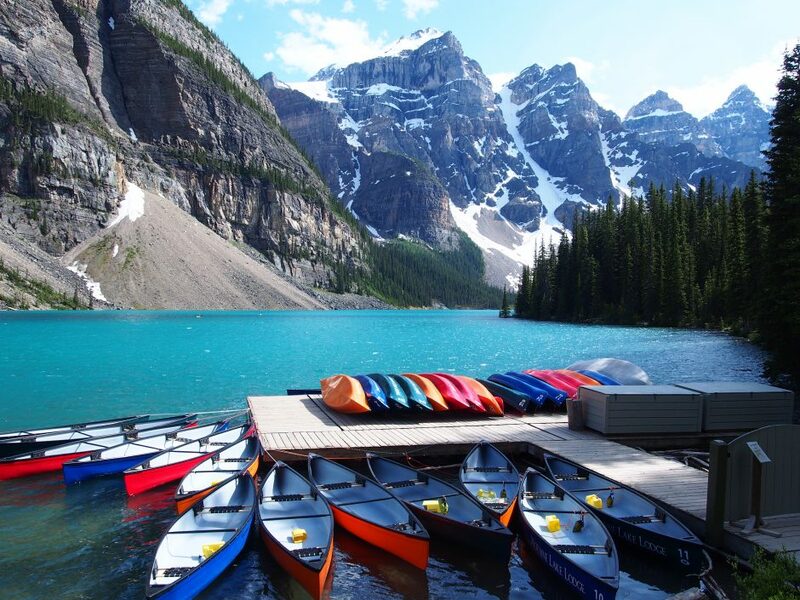 Canoe rentals at Moraine Lake are more expensive than at Lake Louise, which in turn are more expensive than at Emerald Lake (in Yoho… coming in the next post!) They tend to close at the mercy of the weather, so keep an eye out for a nice forecast. It’s definitely one of the most picturesque (and Instagram-worthy) things you can do in the area! We didn’t stay here, but had dinner at Bill Peyto’s Cafe which is inside the hostel. It looked cozy and clean inside, and I wouldn’t hesitate to spend a night here. The food was just okay – I tried the elk burger but forgot to get cheese on it, so it wasn’t very flavorful. They had also run out of a lot of ingredients when we were there for dinner. Go early if you want the full menu. We drove past these adorable little cabins several times, and each time I told myself that when I could afford the non-hostel life, I would want to stay here! I found your blog when researching for my upcoming trip to the Rockies! 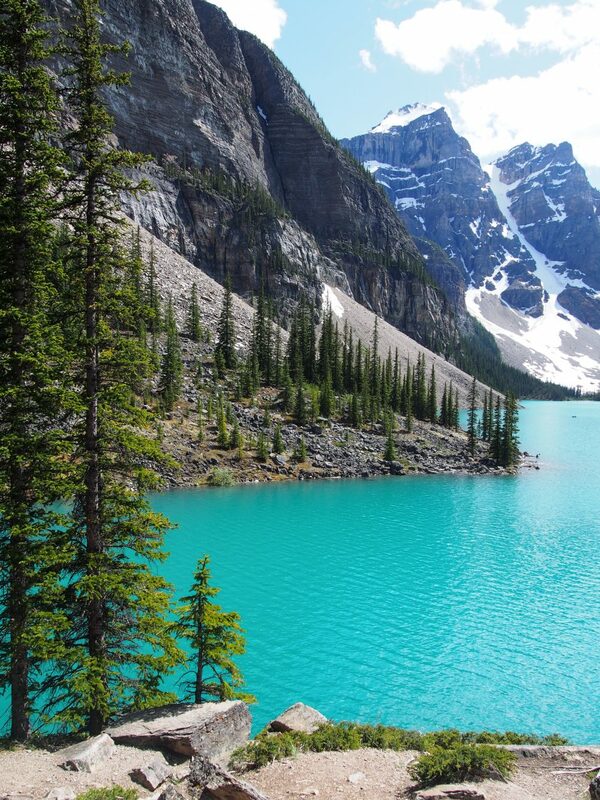 Awesome photographs, and you’ve definitely convinced me that I should spend time in the Lake Louise area! Also, and I think this is super random and cool, but I graduated from UNC-Ch as well ( ’06). Hi Shelley! 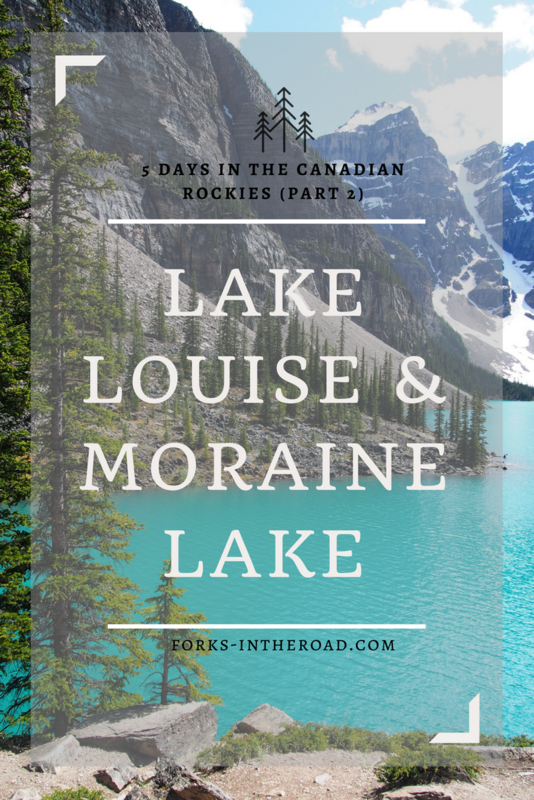 I’m so glad this was helpful – you’re going to LOVE Lake Louise! 🙂 And always amazing to meet fellow Heels through blogging, what a cool connection! GO HEELS! I went to Lake Agnes yesterday and had the mountain bar at the tea house. Amazing!! I, too, tried researching online for a recipe but couldn’t find any, yet came across your page. Did you, by any chance, try to remake it yourself? If so, please share the recipe!